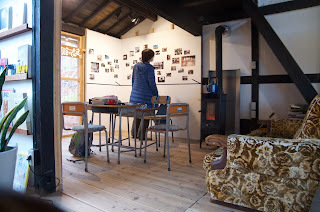 Today was my last day off (Sunday) before this project wraps up. 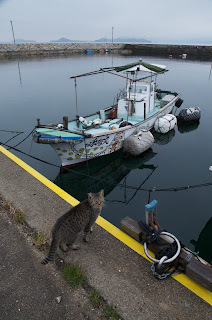 We do a test launch of the boat Thursday and then I leave for Kyoto early Friday morning, spend three days there and fly home on Monday. 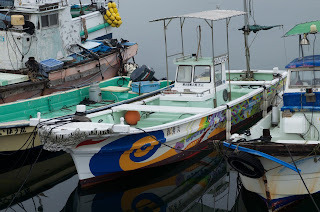 David Billa, the Frenchman I met who lives with his family in Takamatsu City, agreed to take me to Ogi Island, or Ogijima, his favorite spot in Japan. 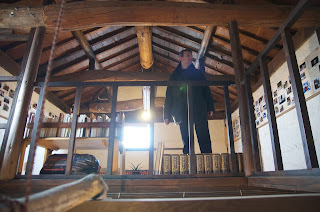 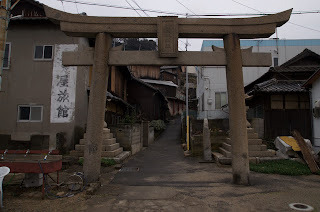 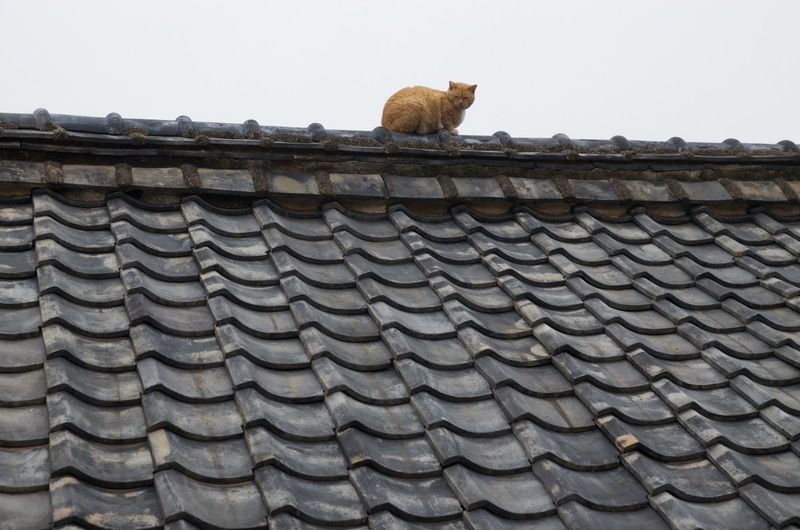 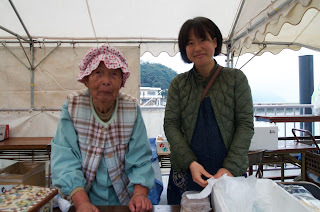 David writes the blog Setouchi Explorer, in French and English. 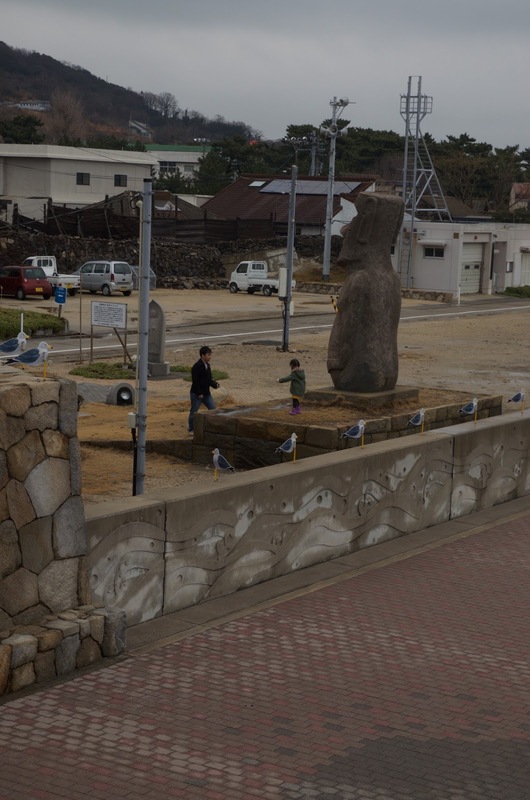 On the way the ferry stops at Megijima, where there is an Easter Island statue at the port. Some years ago a Takamatsu crane company got a contract to work on Easter Island on the restoration of statues and they made one in order to test how to safely lift them. They gave the statue to this island. Approaching Ogijima, which consists of a single village. The boat was pretty quiet. 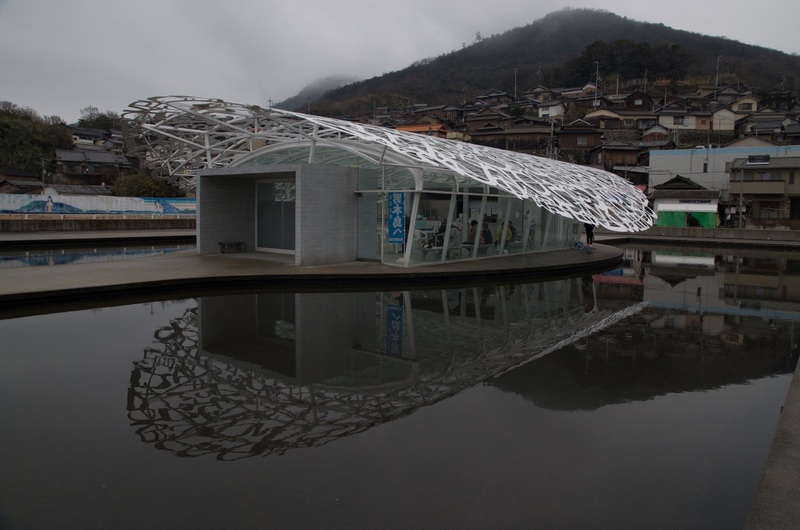 The island's cool visitors center, built for one of the Setouchi Art Festivals. 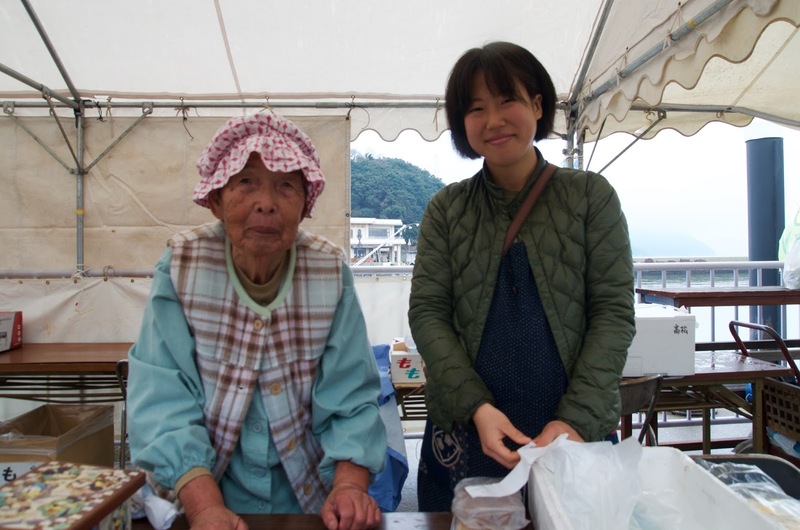 An elderly island resident with a new resident, a business partnership selling food at a small festival. 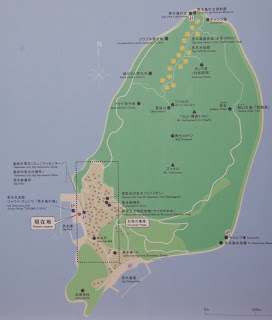 In the last decade or so the island’s population declined to about 120 and the school closed, but the mayor and the islanders developed a plan to encourage new people to move there and its been a success, as the population has come back to 200, the school has reopened (though high schoolers must go to the mainland). 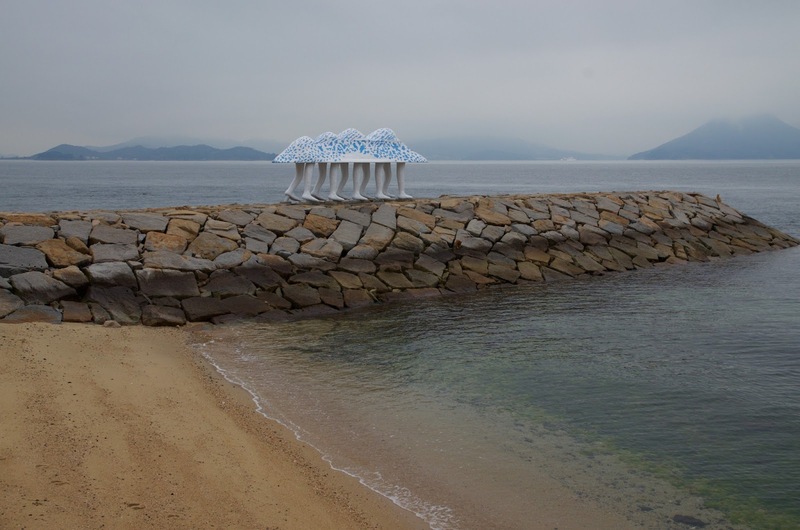 All of the surrounding islands have garnered a lot of attention due to the Setouchi Festival, an international art event which brings artists from all over he world to do installations on the islands. 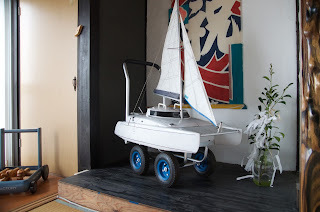 I built a local style of boat in the Festival in 2013. 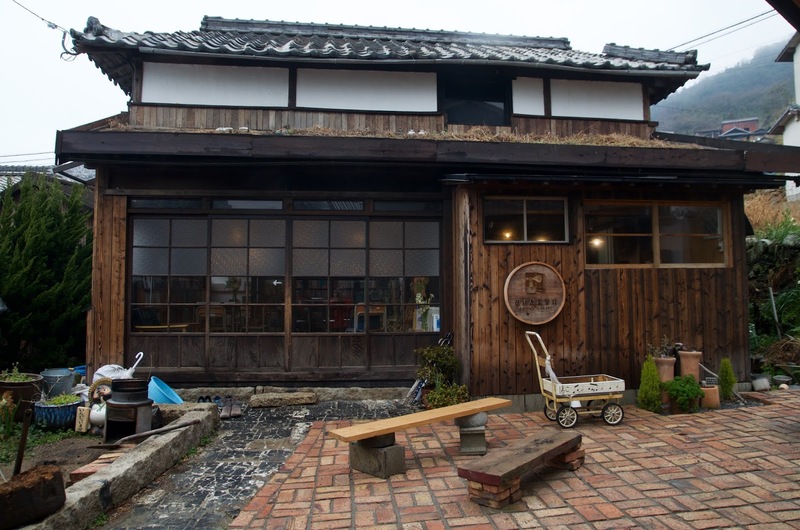 But Ogijima is committed to creating a truly sustainable community, and not one necessarily depending on the tourist trade via the Festival. 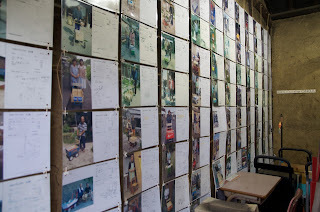 One of the art pieces from a previous Festival. 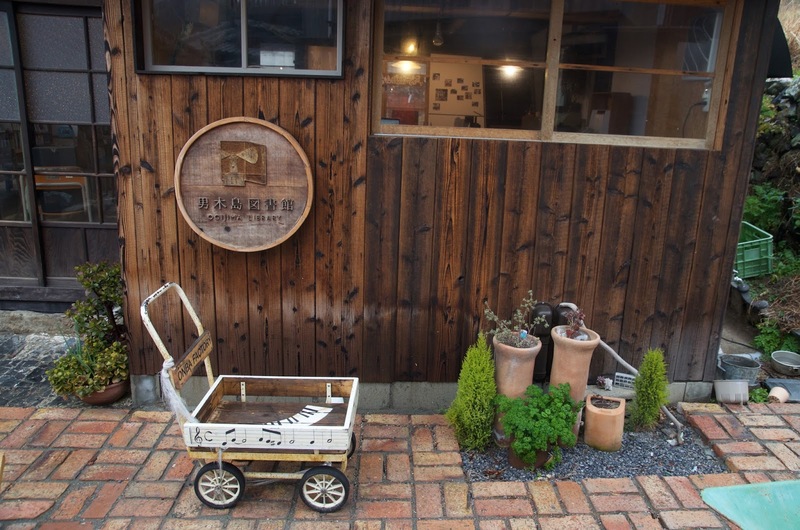 These rural art festivals are catching on all over Japan, spearheaded by Fram Kitagawa and his company Art Front Gallery. And yes, as a point of maritime trivia, Fram's parents did name him after the famous Norwegian ship. 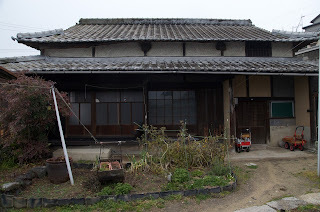 I am planning on applying to his Echigo Trienalle to work with the last boatbuilder of the Shinano River in the mountains of Niigata. 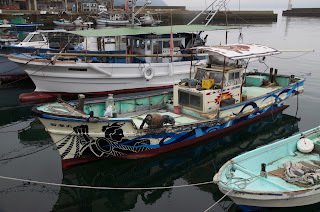 One of the earliest art projects on Ogijima was decorating fishing boats. 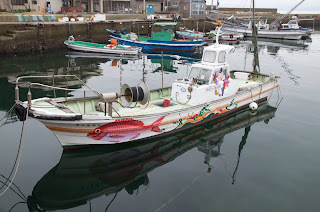 According to David the artist in charge got rip-roaring drunk with the head fisherman and at the end of the evening he agreed to the project. 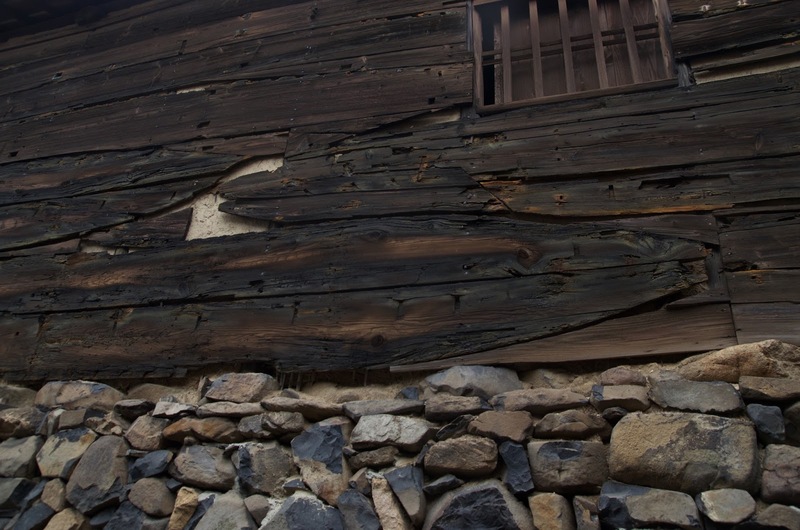 Then, when sober he tried to back out, but his wife said he’d made a promise and had to keep it. 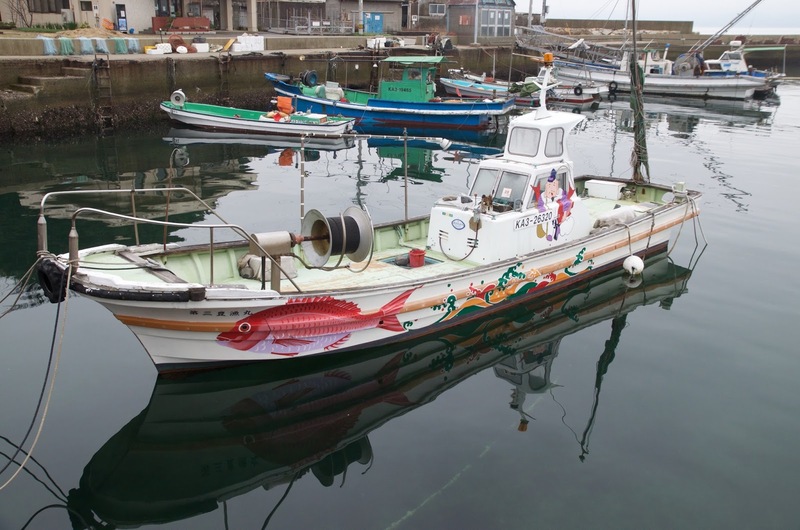 Actually the artist who led this project wound up staying and becoming a fisherman! 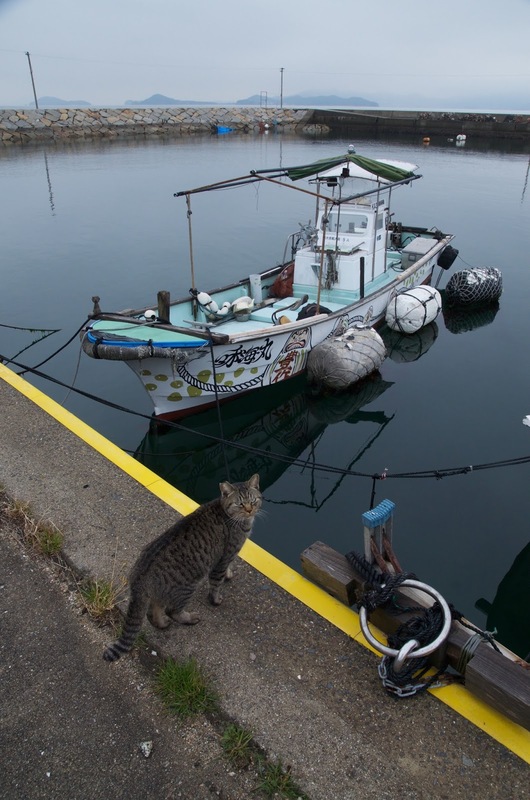 Having one new fisherman on the island was a very big deal, and they’ve since gotten a second. 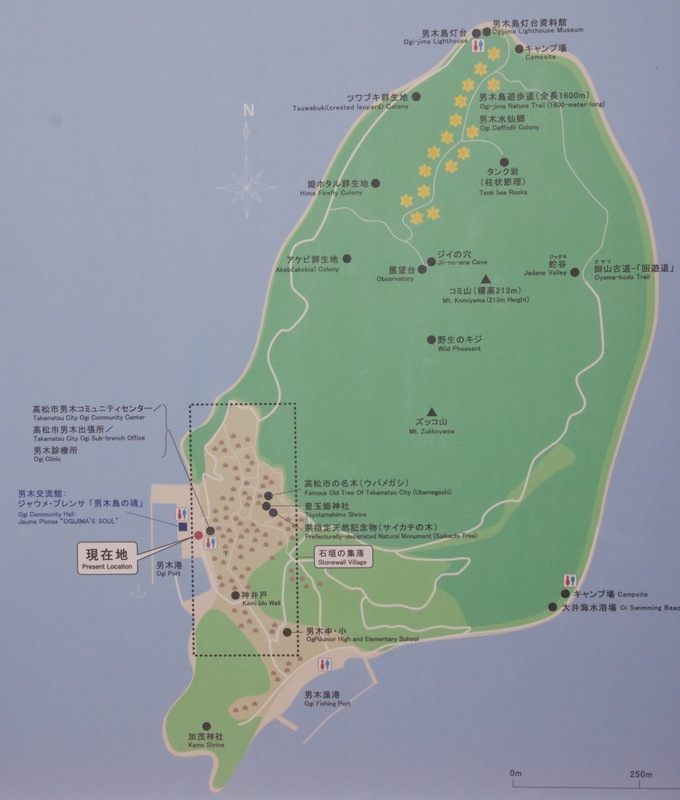 There are two overpopulation problems facing the island: feral cats and wild boar. 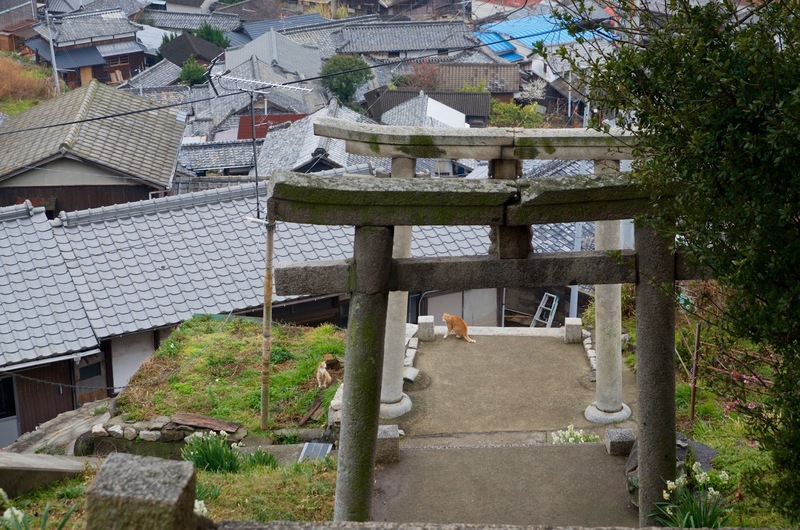 Its estimated there are about 200 wild cats roaming the island and some tourists come specifically to see — and unfortunately feed — them. 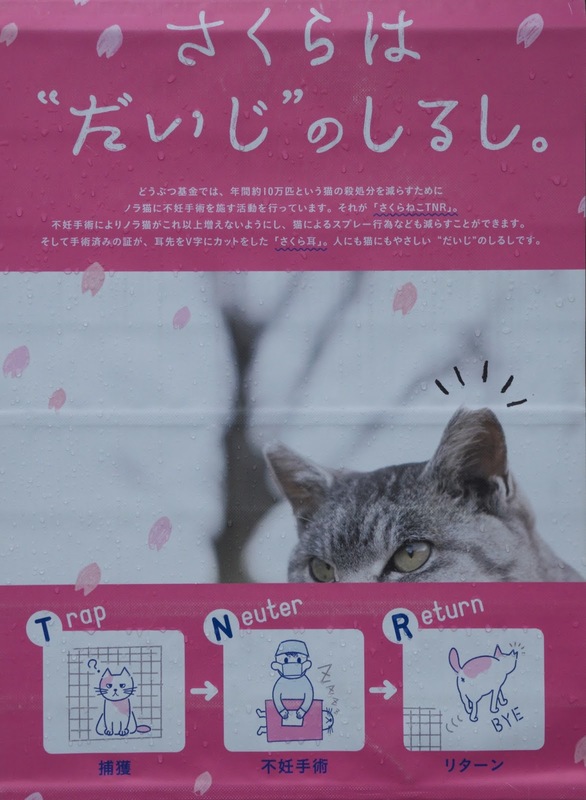 There is a project now to trap and spay/neuter them to control the population. 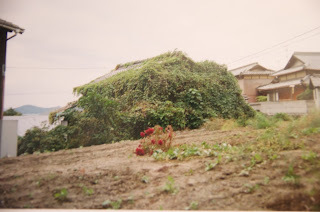 The boar actually swim among the islands and while the entire island was completely deforested at one time, with every scrap of land cultivated with vegetables (not enough fresh water to grow rice), now all those terraced fields have reverted to forest providing perfect habitat for boar. 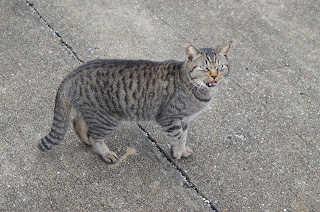 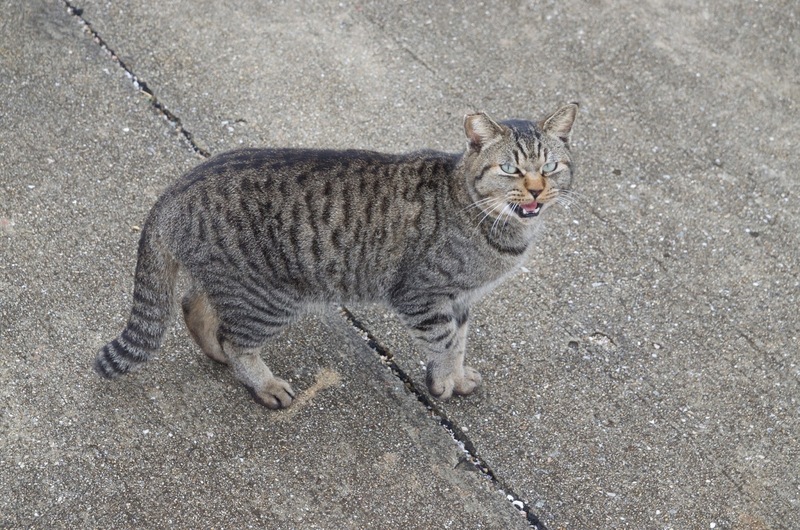 A snipped ear indicates a fixed cat. 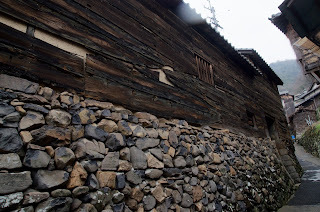 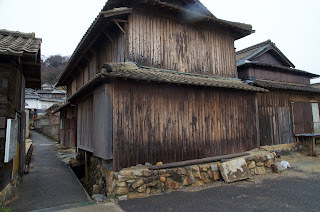 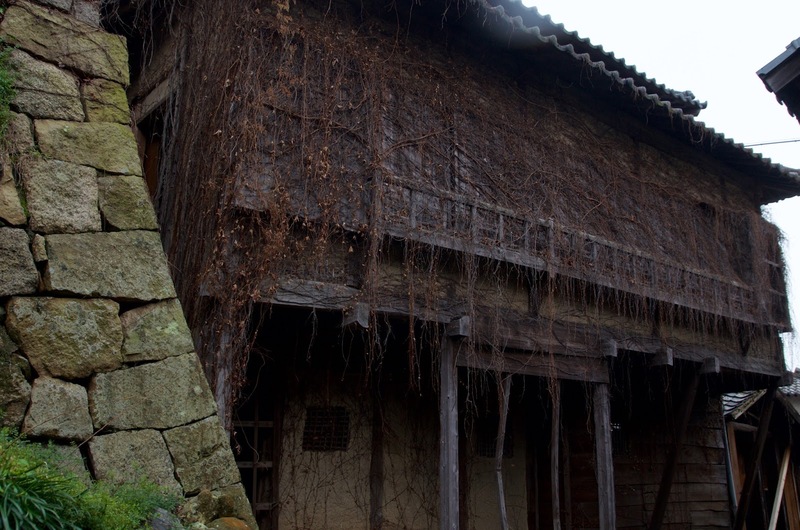 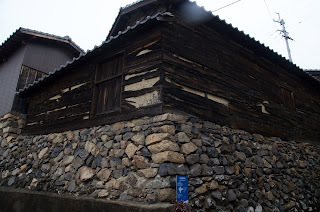 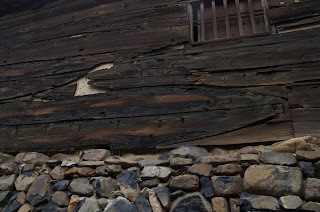 The island is also now one of the rare places left in Japan where one can see old boat planks reused has house siding. I first saw this on Sado Island my first trip to Japan in 1990, and I’ve seen boathouses along remote stretches of the coast with this feature. 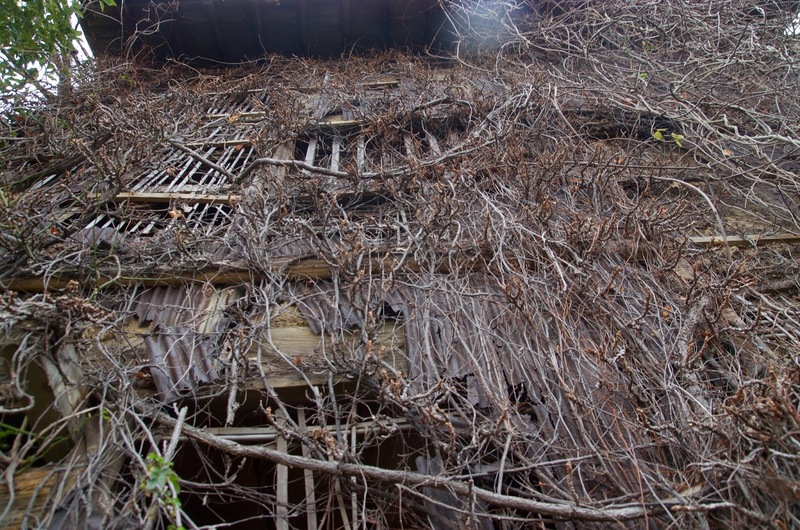 This particular building was abandoned but is now a gallery and installation space for the Festival. 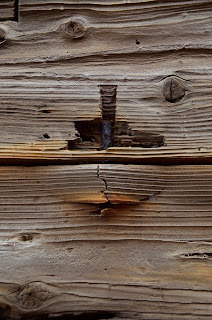 You can make out the curves of the planking, all of which still have nails in them. 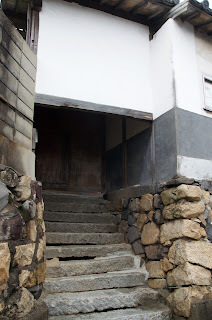 Another feature of some of the older homes are the curious fortified front entrances, with a confined opening and an absurdly small door. 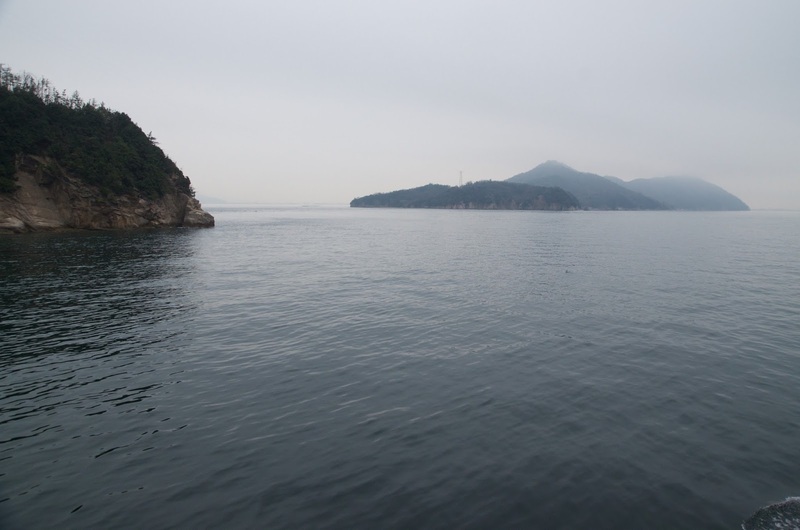 These were defense against pirates that once roamed the Inland Sea. 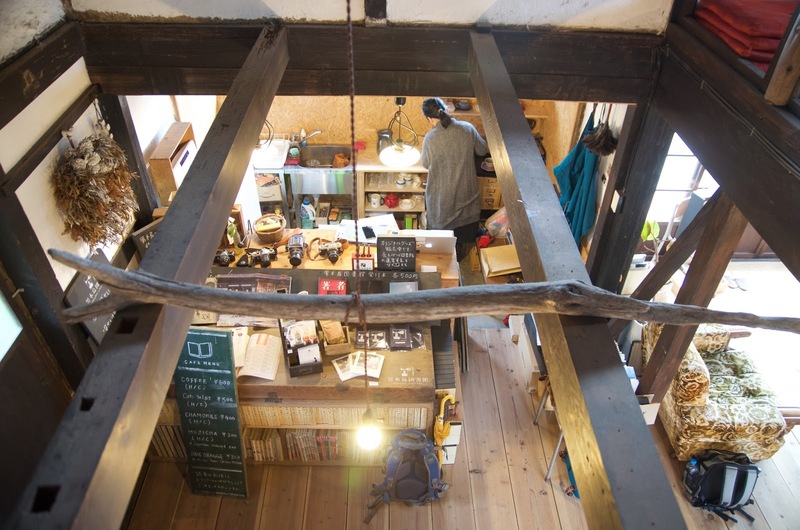 An IT worker decided to move to Ogijima since he can work remotely, and his wife opened the Ogi Library, a reading room and cafe space in a (very) renovated old house. 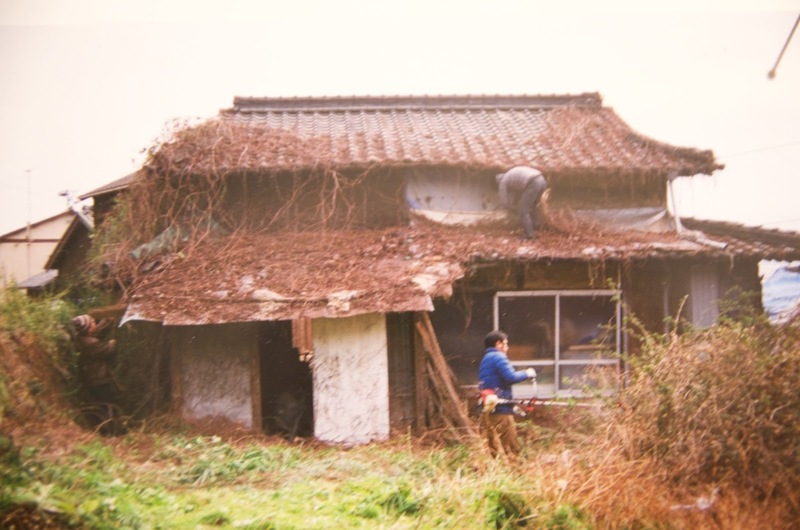 Note my photos of some snapshots showing what it looked like before they started! Another early art project on Ogijima was the Onba Factory. 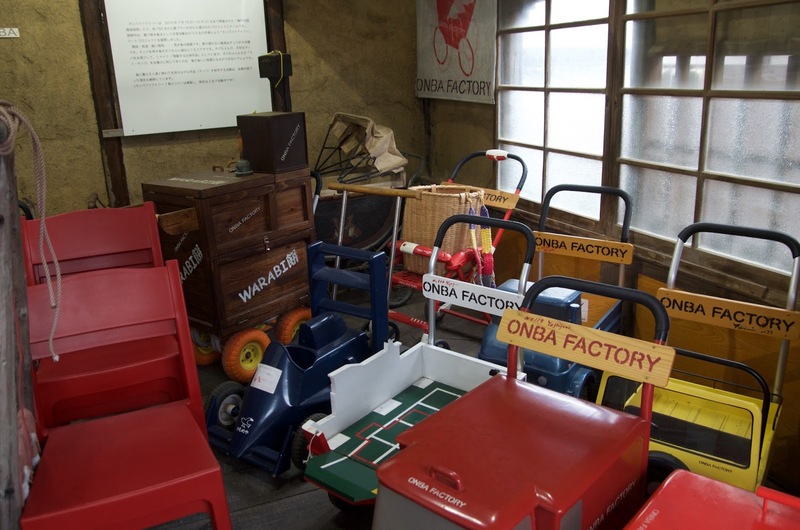 Onba are the carts elderly women push around and the artist has been working with their owners modifying and decorating them of the years. 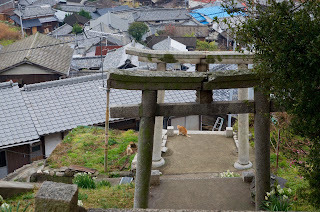 Its become very popular with the locals. 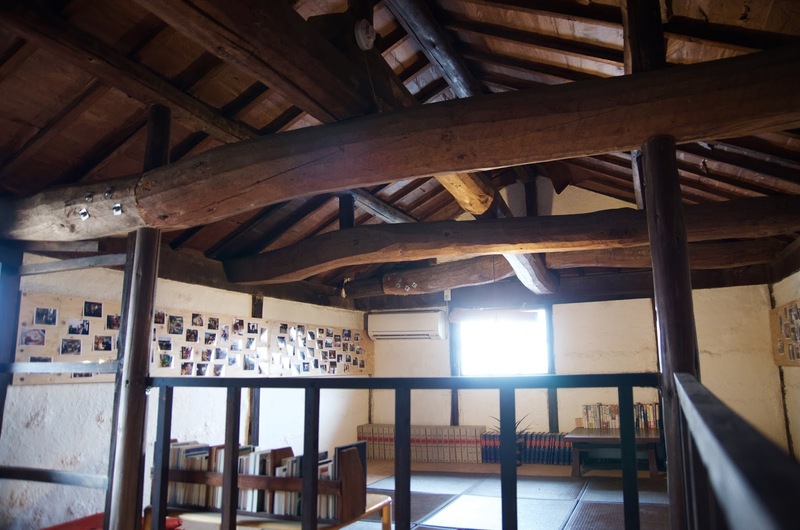 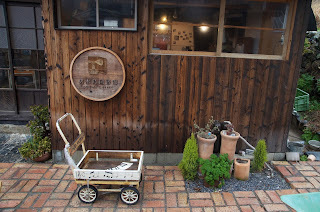 The artist also moved to Ogijima and established a workshop and renovated an old home. Portraits of each resident and their onba. 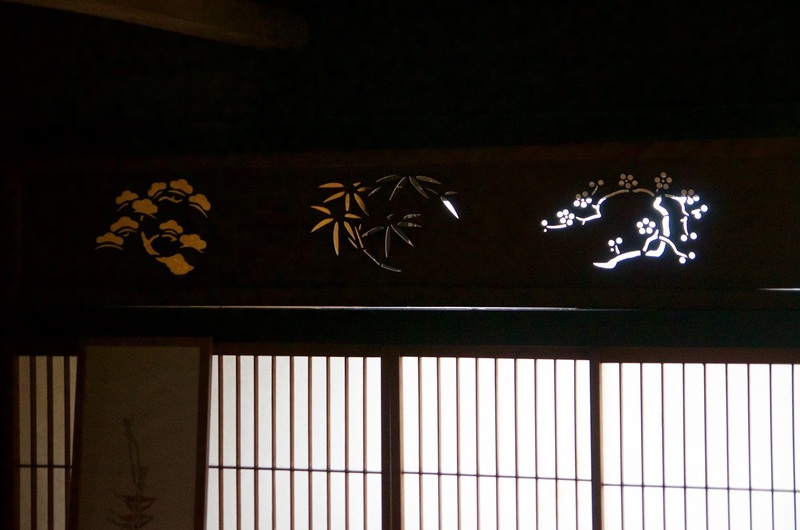 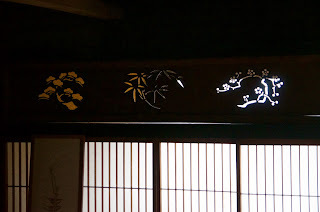 Lovely transom above the shoji, simple designs sawn out of a thin board. 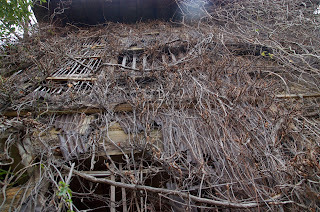 Abandoned houses are everywhere. 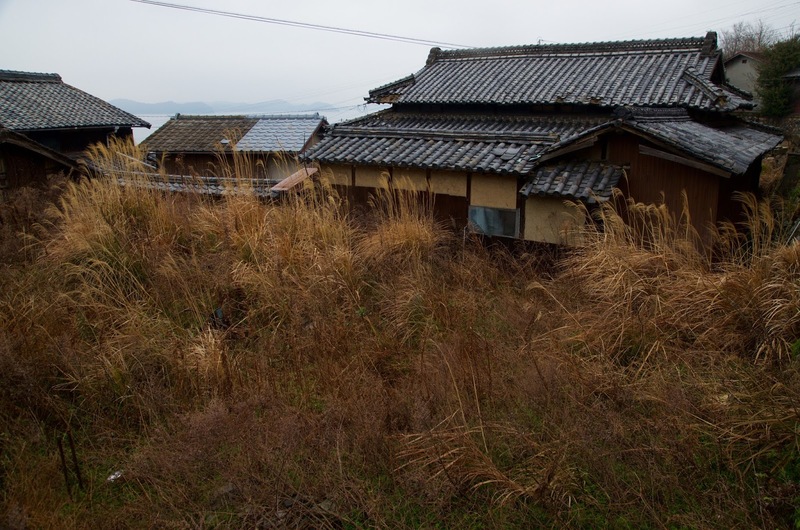 I believe David said the island’s highest population was about 1,000, so there is a huge surplus of homes. 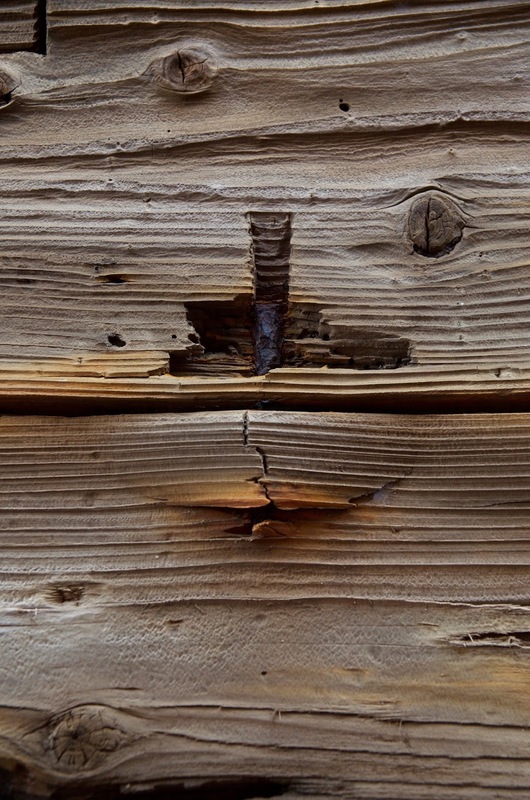 Many are decaying but those who do move here are buying, renting, and renovating. 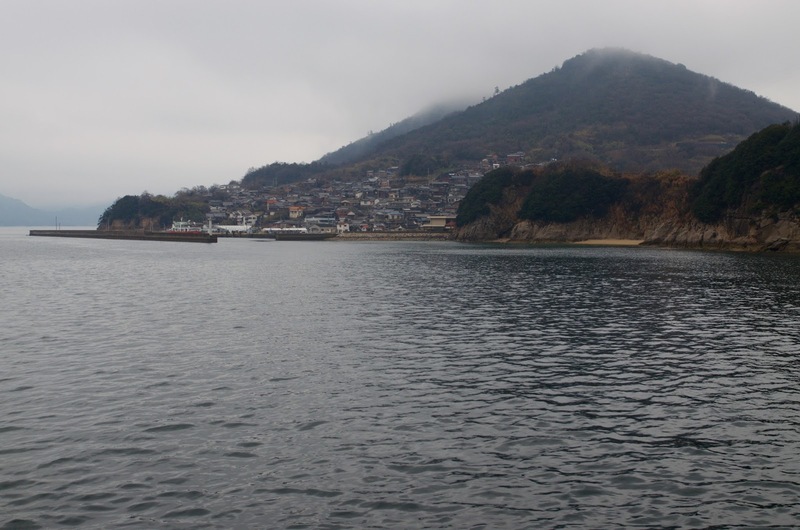 The tip of Ogijima on the left and Megijima on the right. Ogijima's power comes via the overhead transmission line visible. 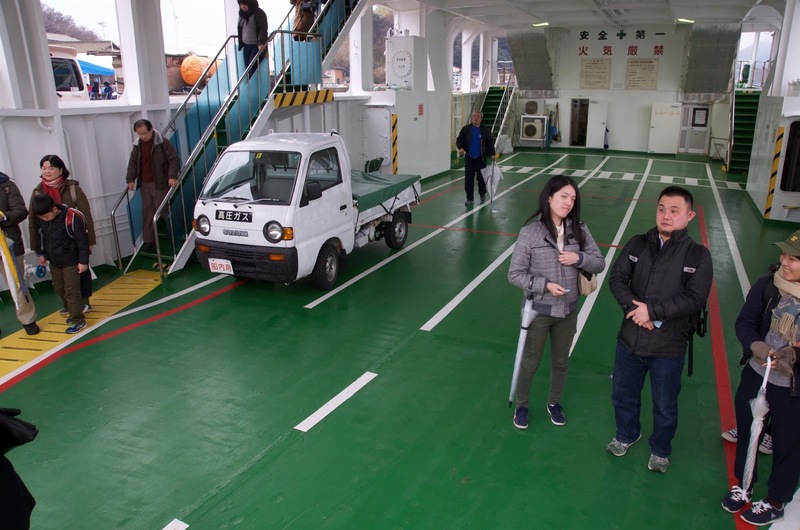 They only recently got a pipe from the mainland giving them a water supply. Previous a couple of small wells and rain water catchment supplied the island.